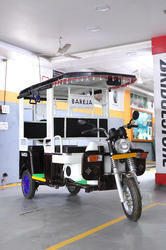 Manufacturer of a wide range of products which include auto e rickshaw. We are providing a qualitative range of Auto E Rickshaw. Available in different specifications, it finds its vast application in daily needs of commutation and especially in highly sensitive zones like zoos, exhibitions ground, amusement parks, university, national parks, hospitals, and supermarkets. In addition to this, we offered these auto E-rickshaws at very reasonable and affordable rates.